For those who are curious about blowing glass themselves at the studio, this will help you to understand a little more what to expect if you do blow glass for the first time. I also suggest reading the BYOB post a few entries down the line as well. Over the course of this past season when we had the bulk of the people coming out to blow glass I was told how I let people do more actual working of the glass than other studios do. 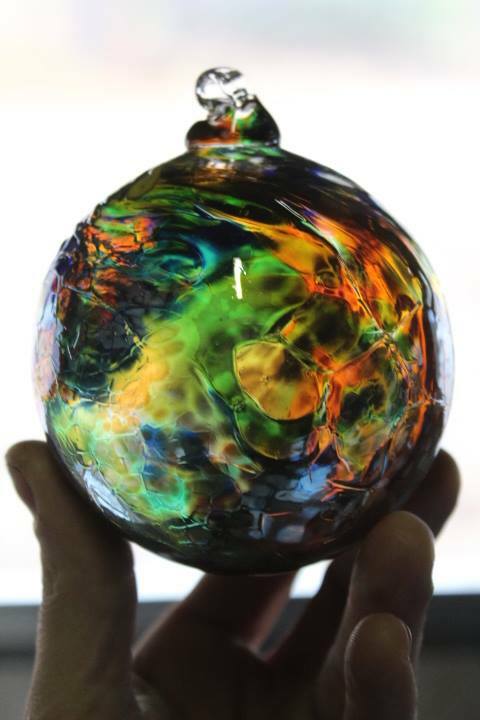 To put this into perspective, most studios when holding an event of this type do not allow their “students” do much more than pick the colors that will go into the piece and then blow into a hose at the end to inflate their ornament. 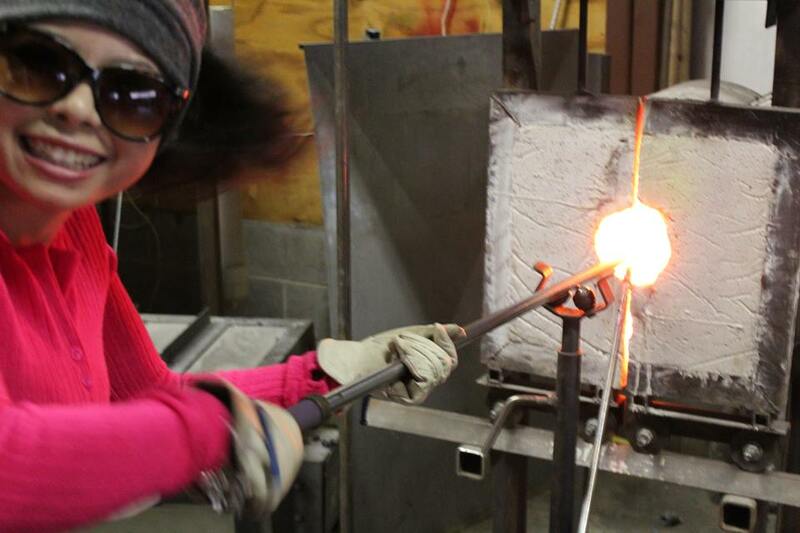 That in itself can be a real thrill for anyone who has never been involved in glassblowing, sure enough. Having worked with glass, knowing its secrets, knowing how amazing a material it is, I have to be honest and say this is not the best way to expose people to the wonders of glass. I know that some studio’s have concerns about liability, some wont let you onto the blowing floor without a rope between you and the pad where glass blowers work. On the one hand it is understandable, but on the other, its not something that a simple explanation about how to keep safe being in the mix wont correct. At the end of the day we all know that hot glass is an extreme material. It is one reason why people are drawn to it in the first place. Children are carefully shown how important it is to stay in certain places while we are working and once you see what it is that we do on the blowing floor, it is easy to remain safe while being up close with this amazing material. It is an opportunity most people do not get in their lifetimes. 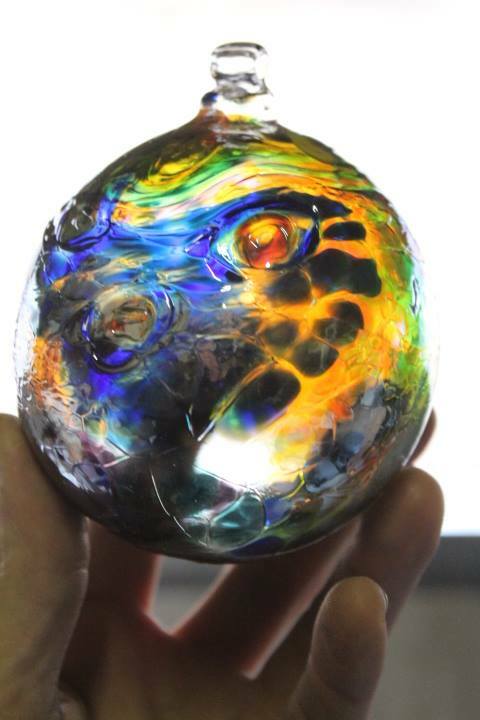 A student piece from our December BYOB at Stafford Artglass. Yes, all you have to do is watch it being made to “get” how amazing this stuff is…..and yet, there is a significant leap that happens between observing and doing. Glass is frustratingly difficult to master. It literally takes years to learn well. The old masters all look forward to getting better with the next piece. We are all pretty humble when it comes to glass (even those who don’t seem to be when you visit their studios or meet them in person at a gallery). 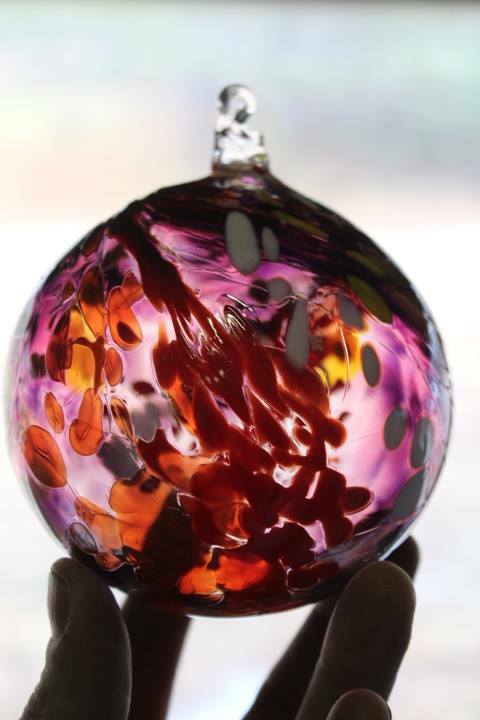 Having said this, my big challenge has been how to involve people more in actual glass making while not making it so hard that we can’t get an ornament made. When I do ornaments with beginners off the street there are several steps that I have to do to ensure that the glass is made right. This is only because some steps cannot be re-done if they are done incorrectly. Like putting on the hanger/eye that covers the hole where the ornament is knocked off the pipe. That step has to be done flawlessly because you have to be able to use the heat in the bit of glass used to cover the hole and get it into perfect hanger shape or everything that you have done prior in making the piece is lost. This step could easily take a day of drilling over and over before a person would get good enough to do it dependably. I know some beginners years later who are still polishing their skills on making good hangers on ornaments! And yet, even at the first go, there is so much a person can learn, and then build upon after that. When you blow an ornament or suncatcher, you select the colors and I lay them out for you. We talk about what kinds of effects you would like in the glass. Would you like the color to cascade like a solid ribbon through the glass or would you like all colors to simply blow out straight? Would you like anything to swirl together, etc. Once that is determined, we have a basic game plan. After that, I talk about the blow pipe and how to keep your hands safe from the heat by knowing how to use the blowpipe. If the person wants to get the glass out of the furnace, they can. This is the most extreme part of the whole process and its not for everyone. It is akin to standing in front of a roaring bon-fire. It is hot and sometimes the gloves you wear will smoke! the glass is shaped quickly by me at the bench before the student heats it and rolls the glass in the bits of color. depending on the intensity of color desired, the student may do this several times, going back from the reheating furnace to the table where the colored glass is kept. Once this is done, I quickly shape the glass and we begin to initiate what is called a “starter” bubble. Once this is done, I attach a flexible line to the end of the pipe and when signaled, the student begins to blow gently first into the hose, further inflating the ornament. Once this has been done, and its most often done very quickly, the suncatcher or ornament is ready to be cooled and broken off the pipe by me. I run quickly to get a bit of glass for the hanger and it is made and put away into a kiln where it must cool for about 12 hours. Weekend and day-long classes are different. While I may do the same steps as mentioned above in the first ornament for a day or weekend class, the point of these classes is to actually give you the skills to balance molten glass on the pipe while blowing/inflating the bubble. Gradually as the steps are shown by doing pieces, the student is given more and more opportunity to repeat the same steps that were shown as we made an ornament for example. In the beginning I do more of the steps so students can observe and learn and then as we move along, the student does more and more of these steps as they are able. If you want to do more in glass, being able to repeat the same form several times in order to build skill is what is necessary. This past season I had two instances where the ornament that was made did not turn out. The third time for two separate cases was the charm. However, I and the student both noted just how much faster they were in the second go-round than they were on the first. It took almost half the time, which speaks to how your own skill increases once you have repeated these forms a few times. This is progress! Once you can cut that same time in half again is where I work when doing production in the studio. 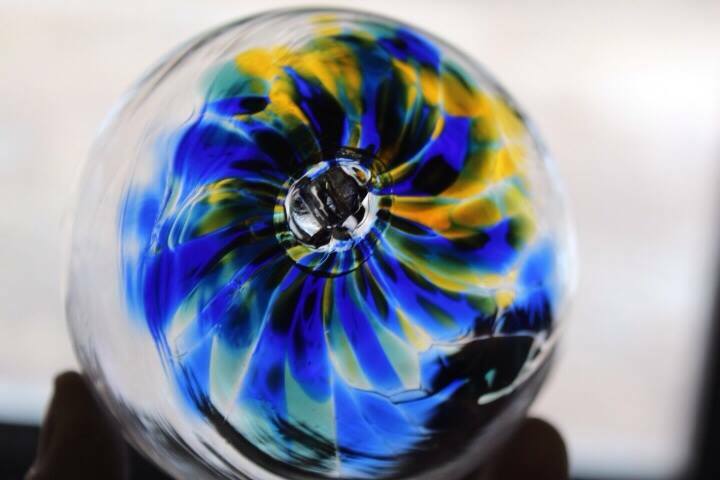 And speed is a very good indicator of skill because with hot glass it means that you are anticipating what the glass will do and you can then work with it to utilize the heat to build the form. You don’t do this as much when you are simply learning what the glass does for the first time. As a result of this, taking a class that builds on skill is what will actually show you how much you can improve and learn with glass….which is a lot! People have said I take a lot of time with my students. I do. What I want to be able to do is to expose them to glass and hope that the glass does the rest for them. And I do have an ulterior motive in all of this; if people so enjoy their experience that they tell their friends about it, or show off their creations, they are helping me to get the word out about what it is that I offer. In a world where we get less cereal in the box for the same size box, I want to continue offering something more than all the rest do. 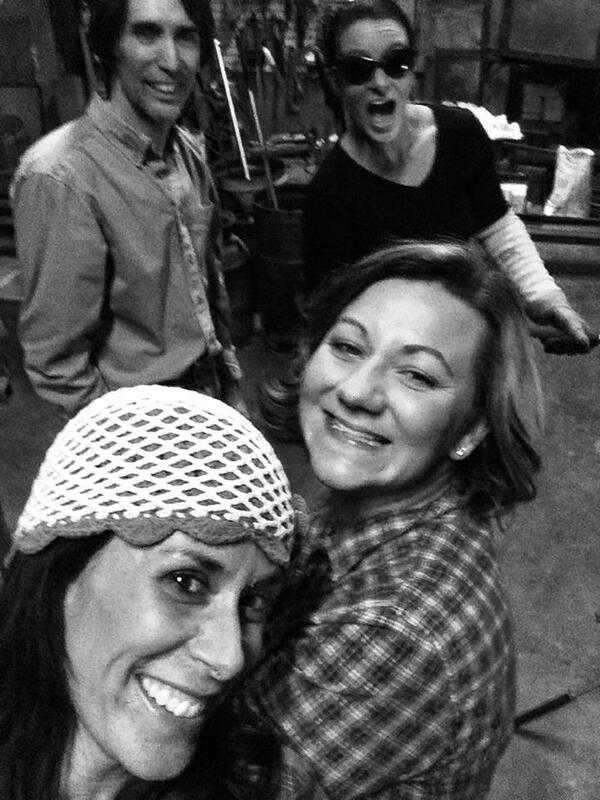 The looks on the faces of the folks who took the last picture below tells the story better than I could ever do!